The Lane Cove Coal and Gas Watch is a sub committee of the Lane Cove Bushland and Conservation Society. A particular focus is on coal mining in Sydney’s drinking water catchment..
5. To amplify and support the messages of other coal and coal seam gas campaigns in NSW and significant campaigns in Australia. The Community Action Award November 2014 – for the most inspiring community action initiative. The Lane Cove Coal and Gas Watch meet on the first Monday of each month at 6.30 -8.30 pm in the Lane Cove Library. There is no meeting in January or July when we take a break. Very informative, run by an enthusiastic bunch, new comers always welcome. Great way to get informed about all the environmental and social impacts of Coal mining and coal seam gas in NSW and get involved in raising awareness of the issues with the general public. See the Lane Cove Coal and Gas Watch Facebook page for news and events – this is kept up to date daily. February 2017 – Recent successful tabling of the 16,000 signature coal and coal seam gas petition in NSW Parliament by Anthony Roberts leading to a debate on the floor of the house. 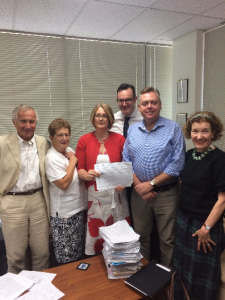 6,000 of these signatures were collected in Lane Cove. Prior to the debate there was a rally outside parliament house where Jann’s petition speech Feb 2017 on behalf of the Lane Cove Coal and Gas Watch.